Alex Theoharides (@Minne_Pop, @TWolvesDaily) takes a look at the current crossroads of the Sacramento Kings. The Sacramento Kings haven’t had a winning record since 2005-2006 when they lost in the first round of the playoffs to the San Antonio Spurs. Since that season, they have won only 187 of 558 games. In other words, Kings players have lost nearly 66% of the games they’ve suited up to play. To give their futility some context, consider the team that beat them in the first round of the 2006 playoffs, the San Antonio Spurs. Since that series, the Spurs have won 387 out of a possible 558 games, which means they have won nearly 70% of the games they’ve played. This season there is little hope that the Kings will break their streak and achieve a winning record. Currently, they sit at 15 wins and 25 losses, placing them one rung up from the cellar in the Western Conference. Sacramento’s roster is made up of castoffs and headcases. Their “star”, DeMarcus ‘Boogie” Cousins, is more famous for his mercurial temperament than his prodigious basketball ability. Their best all around player, Rudy Gay, is a ball stopper and a low percentage jump shooter, who made two teams better when they decided to trade him away. The remaining roster features players like Jimmer Fredette and Derrick Williams, who have yet to live up to their collegiate hype. However, it also features one of the most diminutive and unheralded rising stars in the NBA, Isaiah Thomas, who is capable of holding his own against the best point guards in the league. During the offseason, Sacramento fans made a determined push to save their franchise. Led by city mayor and former NBA stalwart, Kevin Johnson, the city overcame their hapless owners the Maloof Bros, as well as a determined bid from a Seattle group led by hedge fund manager Chris Hansen and Microsoft CEO Steve Ballmer, and managed to convince the NBA to keep the Kings in Sacramento. Shortly after the NBA rejected the Seattle bid, Indian businessman Vivek Ranadivé, bought the franchise for a cool $535 million. Following his purchase, Ranadivé issued a statement in which he promised to build a “21st century franchise” in Sacramento, and immediately set out to make the Kings the most popular team in India. Of course, just because a new owner wants his team to be popular and successful, doesn’t mean they will achieve his goals. Turning around an NBA franchise is not the same as fixing a hemorrhaging Fortune 500 company or digitizing Wall Street. In reality, there are only three ways for an NBA team to make an abrupt transition from perpetual losers to championship contenders. The first method seems easy: Tank during the season and get lucky in the NBA draft. So far, the Kings have struggled in that regard. Over the past 7 seasons, they’ve never drafted higher than the 5th pick (which they used on Cousins). However, this year they have a top 12 protected pick, which should give them the opportunity to choose from the myriad of college and international stars who are planning to enter the 2014 NBA Draft. Of course, unless that pick happens to be the next Lebron James, Kevin Durant, or Tim Duncan, they are more likely to end up with yet another piece to a rebuilding project that will take a few more years to reach fruition. The second method of quickly improving an NBA team is much more difficult to accomplish: Clear cap space and convince stars to sign with your team. This method works in Miami and Los Angeles, and it should work in New York. However, Sacramento is not exactly a high profile destination for stars, who often make more money on endorsement deals than they do from their NBA contracts. These deals are based on marketability. As the 10th smallest market in the NBA, Sacramento is a hard sell for free agents. Still, with the global expansion of the NBA and Ranadive's connections in India, there is an increasing chance that the Kings will be able to lure stars by hyping lucrative endorsement deals in India that will come about by way of an NBA contract with the Sacramento Kings. Ranadivé’s ties in India were cited as at least part of the reason why Shaq decided to join the Kings’ ownership group. The final method of turning around an NBA franchise involves trading assets for NBA stars. This method has been perfected by the Houston Rockets’ general manager Daryl Morey, who famously traded Kevin Martin, Jeremy Lamb and a 2013 draft pick for James Harden. So far, the Kings seem determined to follow in Morey’s footsteps. In November, they traded defensive stalwart Prince Luc Richard Mbah a Moute for former second overall pick Derrick Williams. A few weeks later, they sent John Salmons, Greivis Vasquez, Patrick Patterson, and Chuck Hayes to Toronto in exchange for Gay, Aaron Gray, and Quincy Acy. The early returns on the Gay and Williams trades seem positive. In January, the Kings have a record of 4 wins and 4 losses, including a victory over the Portland Trail Blazers. Williams is still struggling to find his position in the NBA, but since being traded Gay’s shooting percentage is up more than 12 percentage points and he is averaging nearly 20 points per game. However, the reality of the King’s future remains murky. On one hand, their win now methodology puts their future flexibility in doubt. 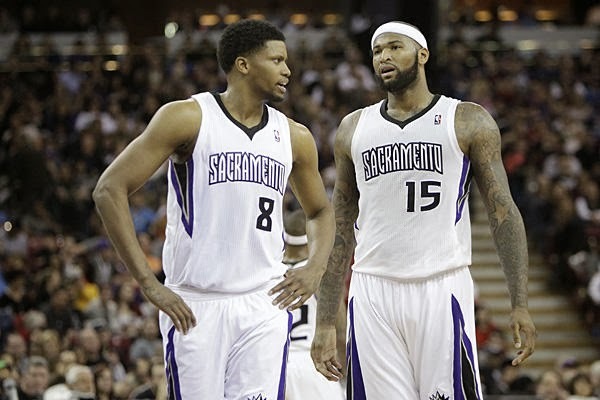 There is little evidence to suggest that a roster built around Rudy Gay and DeMarcus Cousins will ever succeed. On the other hand, Sacramento finally see signs of life in their team. Although the Kings won’t be successful in 2014, there is at least the hope in Sacramento that Kings have a plan in place to build toward a better future. Jimmer Fredette needs to be traded. One destination that has been mentioned is The Minnesota Timberwolves who desperately need shooting. However, this trade only happens if the Wolves also find a way to move JJ Barea. Despite my prediction that the Memphis Grizzlies would collapse, they remain in playoff contention in the Western Conference. With Marc Gasol seemingly recovered from his injury, they would be a tough out for any of the top seeds in the West. In the month of January, Kevin Durant is averaging 36.1 points per game, which is putting to rest the theory that Paul George is the second best player in the NBA. The San Antonio Spurs remain the most complete team in the West. While the Thunder have the highest upside and the Blazers have had the best regular season, no team executes better in the final minutes of close games than San Antonio. While Kyrie Irving continues to showcase his talent on the offensive side of the court, he struggles to defend quick point guards like Isaiah Thomas who scored 26 points against the Cavs or Damian Lillard who scored 28. Rudy Gobert has a chance to be the most interesting "really tall big man" since Yao Ming. Chris Douglas-Roberts has the craziest hair since Martell Webster played in Minnesota. Best of the Week: Kevin Durant’s 54 point demolition of the Golden State Warriors. Worst of the Week: JR Smith’s continued inability to find, let alone cover, his man on defense.